Plants perennial, mat-forming; rhizomes evident, long, 0.7-2 mm thick, firm, cortex persistent, longer internodes 1-2 cm, scales often fugaceous, 6-8 mm, membranous, not fibrous. Culms terete or cross section elliptic or rectangular, with 5-10 blunt ridges when dry, 25-50 cm × 0.5-1.2 mm, firm to hard, spongy. Leaves: distal leaf sheaths persistent, not splitting, mostly proximally dark red, distally red to brown or green, thinly papery, apex usually red-brown, often callose, subtruncate to obtuse, tooth usually present on some or all culms, to 0.9 mm. Spikelets usually ovoid or ellipsoid to subcylin-dric, rarely lanceoloid, 4-12 × (1.5-)2-3 mm, apex rounded to acute; proximal scale amplexicaulous or clasping over 3/4 of culm, entire; subproximal scale empty or with flower; floral scales appressed in fruit, 30-100, 6-10 per mm of rachilla, orange-brown, midrib regions often greenish, oblong to ovate, 1.5-2.5 × 1-1.5 mm, apex entire, broadly rounded, sometimes acute in distal part of spikelet, usually horizontally wrinkled and recurved, often carinate in distal part of spikelet. Flowers: perianth bristles 5-6(-7), stramineous to medium brown, stout, often unequal, much shorter than to equaling achene, rarely all rudimentary; stamens 3; anthers dark yellow to stramineous, 0.8-1.5 mm; styles 3-fid or some 2-fid. Achenes falling with scales, dark brown, obovoid to obpyriform, compressed trigonous, angles evident to obscure, 0.7-1 × 0.65-0.8 mm, neck absent to sometimes long, finely rugulose at 10-30X, over 20 horizontal ridges in vertical series, and/or minutely cancellate at 20-30X. Tubercles brown to whitish, pyramidal, as high as wide or sometimes greatly depressed, (0.1-)0.25-0.3 × 0.2-0.3 mm. 2n = 20. Fruiting spring-fall. Wet soil, fresh ponds, lakes, streams, springs, seeps, marshes, ditches, grasslands; 0-2300 m; Ala., Ariz., Calif., Fla., Kans., La., Miss., N.Mex., N.C., Okla., S.C., Tex. ; Mexico; South America. 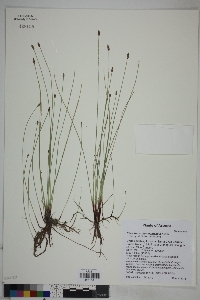 The name Eleocharis montana was long misapplied to E. montevidensis. The type of E. palmeri, recognized as a species (H. K. Svenson 1957), is indistinguishable from specimens of E. montevidensis. Eleocharis montevidensis is extremely variable; the broadly rounded, usually wrinkled and recurved floral scales are diagnostic. Achenes often fail to form. Eleocharis montevidensis is apparently closely related to E. parishii, in which the floral scales are less densely placed on the rachilla and acute to rounded, and the spikelets are narrowly lanceoloid to cylindric. 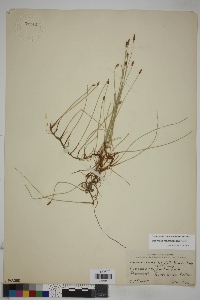 In the absence of achenes and rhizomes, some specimens of E. montevidensis are easily mistaken for E. tricostata.